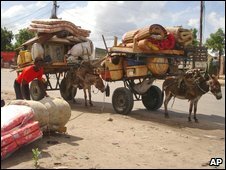 Thousands of residents of Somalia's capital are fleeing as the death toll from fighting in Mogadishu rises. A health official told the BBC that 14 people had been killed overnight. A local human rights group estimates more than 120 have died in recent days. 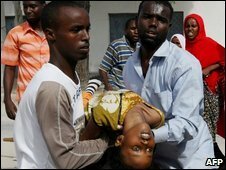 On Monday, Somalia's President Sheikh Sharif Sheikh Ahmed blamed radical Islamists for the renewed bloodshed. He told the BBC the hardliners had no interest in ending the violence and wanted to take Somalia by force. The fragile interim government has been fighting radical Islamist groups like al-Shabab since 2006. The latest fighting began on Thursday and escalated over the weekend between pro-government forces and Islamist groups. A spokesman for a local human rights group told a radio station in the capital that the fighting had caught residents unawares. "The fighting erupted in the most densely populated areas," Elman Human Rights Group's Ali Shaykh Yasin told HornAfrik radio. "The number of people killed who we saw were 123, while 312 others were wounded," he said. His group estimates that more than 17,000 people have fled so far. An ambulance driver says the bodies his service collected overnight were mostly of civilians. Local journalist Mohamed Sheikh Nor told the BBC that fighting had died down by Tuesday morning, but sporadic gunfire could be heard in parts of the city. President Sharif took office in January leading the Western-backed government set up after UN-brokered peace talks. But even his fragile administration's introduction of Sharia law to the strongly Muslim country has not appeased the radical guerrillas who battle pro-government forces and African Union troops in the capital almost daily. Somalia, a nation of about eight million people, has experienced almost constant conflict since the collapse of its central government in January 1991.